Which CASB Deployment Mode is Right for Me? When kicking off a cloud security project, you'll quickly discover that there are multiple deployment options for a cloud access security broker (CASB) – Log Collection, API, Reverse Proxy, and Forward Proxy – delivered via the cloud, on-premises, or hybrid - and with or without agents. 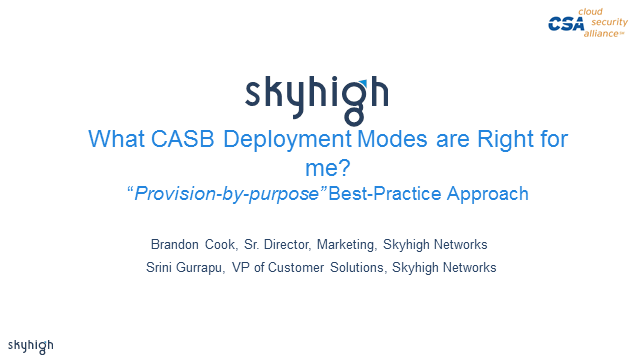 But which CASB deployment mode is right for your organization? It depends on which use cases you need to support across which users and devices. In this webinar we’ll share an objective overview of the use cases each CASB deployment option supports. Just as importantly, we’ll detail which use cases each deployment mode does not support and provide case studies explaining how companies like Aetna, AstraZeneca and Western Union leveraged various deployment architectures to cover all their key use cases (visibility, compliance, data security, and threat protection) across O365, Salesforce, Box, and Shadow IT. Srini Gurrapu is the VP, Solutions Strategy at Skyhigh Networks, with 20 years of experience in networking, security, virtualization, mobile and cloud security markets. Srini's primary forte is building trusting advisory relationships with customers and delivering innovative solutions that make customers successful in their strategic initiatives. Brandon leads the marketing team at Skyhigh Networks and has over a decade of experience in the tech industry identifying and developing new markets. As a regular contributor to the Cloud Security Alliance (CSA) events and blogs and author of the quarterly Cloud Adoption and Risk Report, he has expertise in “shadow IT”, cloud security, cloud governance, and cloud regulatory compliance. Title: Which CASB Deployment Mode is Right for Me?